We present a procedure for controlling the initial cell cluster shape in a 3D extracellular matrix to obtain a repeatable pattern formation. 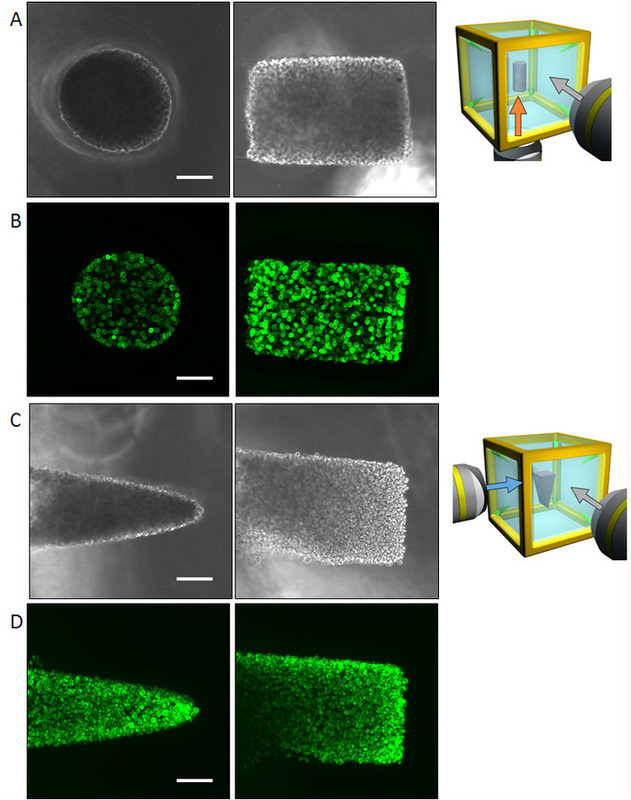 A cubic device containing two different hydrogels is employed to achieve multi-directional imaging for tissue pattern formation. Hagiwara, M., Nobata, R., Kawahara, T. Initial 3D Cell Cluster Control in a Hybrid Gel Cube Device for Repeatable Pattern Formations. J. Vis. Exp. (145), e59214, doi:10.3791/59214 (2019). The importance of in vitro 3D cultures is considerably emphasized in cell/tissue culture. However, the lack of experimental repeatability is one of its restrictions. Producing few repeatable results of pattern formation deteriorates the analysis of the mechanisms underlying the self-organization. Reducing variation in initial culture conditions, such as the cell density and distribution in the extracellular matrix (ECM), is crucial to enhance the repeatability of a 3D culture. In this article, we demonstrate a simple but robust procedure for controlling the initial cell cluster shape in a 3D extracellular matrix to obtain highly repeatable pattern formations. 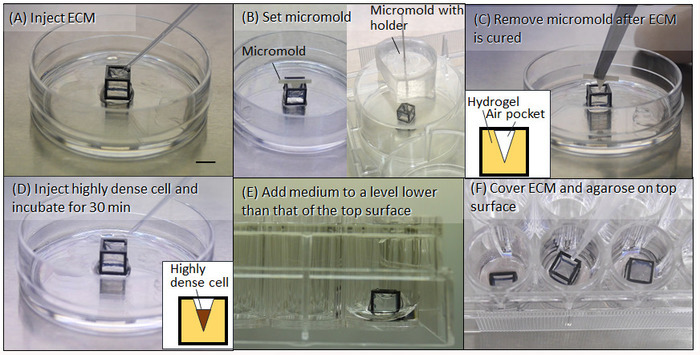 A micromold with a desired shape was fabricated by using photolithography or a machining process, and it formed a 3D pocket in the ECM contained in a hybrid gel cube (HGC). Highly concentrated cells were then injected in the pocket so that the cell cluster shape matched with the fabricated mold shape. The employed HGC allowed multi-directional scanning by its rotation, which enabled high-resolution imaging and the capture of the entire tissue structure even though a low-magnification lens was used. Normal human bronchial epithelial cells were used to demonstrate the methodology. The importance of a 3D culture, which better mimics biological environments than does a 2D culture, is considerably emphasized in cell/tissue culture1,2,3. The interaction between the cells and extracellular matrix (ECM) provides important cues regarding morphogenesis4,5. Many tissue formations can emerge only under 3D environments, such as the folding process6,7, invagination8, and tubular formation9,10. However, numerous difficulties prevent researchers from shifting to 3D experiments from 2D experiments on a dish. One of the major difficulties in 3D experiments is the issue of imaging 3D samples. Compared with planar experiments, acquisition of appropriate 3D images is still challenging in many cases. In particular, obtaining an appropriate 3D image is a difficult task when the sample size reaches the millimeter range owing to the large focal depth of low-magnification lenses. For example, the focal depth reaches more than 50 µm when a 10x magnification lens is used while the size of the single cell is normally less than 10 µm. To enhance the imaging quality, high-technology microscopy systems are being developed (e.g., two-photon microscopy11 and light-sheet microscopy system12), but their availability is limited owing to their expensive price. As an alternative, we have previously developed a hybrid gel cube (HGC) device13. The device consists of two types of hydrogels: agarose as a support gel and an ECM such as collagen or Matrigel as a culture gel. The HGC allows us to collect the sample during culturing and rotate the cube to achieve multi-directional imaging, which addresses the focal depth problem14. Another difficulty in 3D experiments is their low repeatability owing to the poor controllability of the 3D environments. Unlike a planar culture on a plastic dish, variations in the initial culture conditions easily occur in a 3D space surrounded by a soft material. A significant variation in the experimental results deteriorates the following analysis and masks the underlying mechanisms. Many engineering technologies have been developed to spatially align single cells, such as bioprinting15,16, fiber weaving17, and scaffolding18, but they require complex preprocessing or specifically designed equipment. In contrast, we have developed a methodology for achieving 3D cell alignment in an HGC19. In this protocol, we illustrated a simple procedure with commonly used equipment for controlling the 3D initial cell cluster shape in an HGC. First, the fabrication process of the HGC was demonstrated. Then, micromolds fabricated by photolithography or a machining process were placed in the HGC to produce a pocket with an arbitrary shape in an ECM. Subsequently, highly dense cells after centrifugation were injected into the pocket to control the initial cell cluster shape in the HGC. The precisely controlled cell cluster could be imaged from many directions because of the HGC. Normal human bronchial epithelial (NHBE) cells were used to demonstrate the control of the initial cell cluster shape and imaging of the branches from multiple directions for enhancing the imaging quality. Prepare a polycarbonate (PC) cubic frame either by using a machining process or a 3D printer. The size of the PC frame depends on the sample size. In this study, we used a frame of 5 mm on each side so that the branches had sufficient space to elongate during culturing. Place the PC frame on a pre-cooled glass slide or another smooth surface in an ice box (<0 °C) (Figure 1A). Add 12 µL of pre-heated 1.5% agarose (w/v) from the top face of the cubic frame to the bottom surface with a pipette. Stroke the pipette so that the agarose spreads to create a flat surface (Figure 1B). Within minutes, the agarose will be cured. Pick up the PC frame by sliding it to the edge of the glass slide using tweezers. Note that vertically picking up the frame from the glass slide may result in detaching of the agarose from the cubic frame owing to the adhesive force between the agarose and the glass slide (Figure 1C). Rotate the cubic frame to make the open face down, and then place on the glass slide again (Figure 1D). 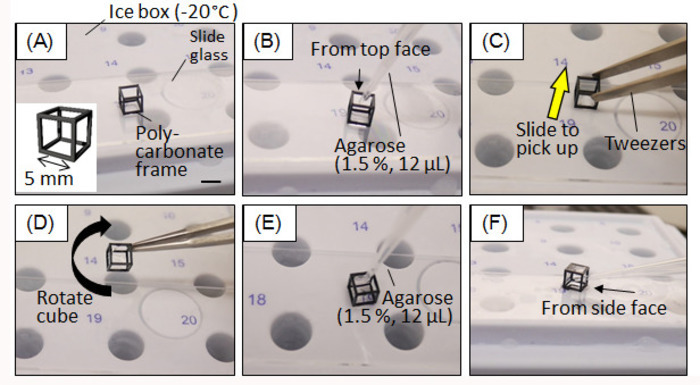 Repeat steps 1.3–1.5 until three surfaces are filled with agarose (Figure 1E). To form an agarose wall on the fourth and fifth faces, drop the agarose in from an open face (Figure 1F). Once an agarose wall is formed on the fifth face, the preparation of the HGC is completed. Clean a silicon (Si) wafer via ultrasonic cleaning with acetone, isopropyl alcohol (IPA), then distilled (DI) water for 5 min each. After nitrogen blowing the Si wafer with nitrogen, dehydrate in an oven at 140 °C for 20 min (Figure 2A(i)). Spin-coat a sacrificial layer such as LOR and Az resists on the Si wafer (2,000 rpm, 30 s) by using a spin-coater under yellow light. Immediately after spin-coating, heat the wafer on a hot plate at 90 °C for 3 min (Figure 2A(ii)). The desired thickness of the sacrificial layer is more than 1 µm so that the lift off process can be carried out easily, but an accurate thickness is not necessary. Develop a negative photoresist by immersing the wafer in propylene glycol monomethyl ether acetate (PGMEA) until the unexposed area is completely dissolved (approximately 20 min) (Figure 2A(v)). Dissolve the sacrificial layer by using IPA for ultrasonic cleaning to lift off the microstructure. Once the microstructure is peeled off from the wafer, rinse with DI water by ultrasonic cleaning for 10 min (Figure 2A(vi)). Immerse the mold in 30 µL of the MPC polymer for 30 min at room temperature (approximately 20 °C) to completely dry it out. Figure 2B shows the fabricated prism mold. Immerse the cylinder steel in 30 µL of the MPC polymer for 30 min at room temperature (approximately 20 °C) to completely dry it out. Prepare liquid polydimethylsiloxane (PDMS) by mixing base resin and its catalyst (see Table of Materials) in a 10:1 ratio followed by degassing with a vacuum degassing system for 20 min. Then pour the PDMS in a 12-well-plate. Set the steel cylinder perpendicular to the datum surface and fixed to a linear z-stage so that it can be perpendicularly inserted in the uncured PDMS surface in a 12-well-plate placed on the same datum surface by moving the z-stage. Incubate the PDMS with the cylinder steel in an oven for 20 min at 90 °C for curing. Cut the PDMS to form a flank surface so that the pipet can be inserted in the following process (Figure 2C). Inject an appropriate ECM for the desired cell culture, such as collagen and artificial basement membrane, into the HGC to fill the culture space (Figure 3A). Set the fabricated micromold on the HGC directly or indirectly with an appropriate holder, as shown in Figure 3B. Subsequently, place the HGC in a CO2 incubator for 25 min at 37 °C for curing it. Carefully lift out the micromold so that the ECM does not deteriorate (Figure 3C). The pocket, as the desired mold shape, will be fabricated in the ECM. Harvest cells from the cultured dish by trypsin–EDTA or its equivalent depending on the cell types. Subsequently, centrifuge the cells to obtain highly concentrated cells (for NHBE culture, apply 0.25% trypsin-EDTA and incubate cells for 3 min, then neutralize with FBS-containing medium and centrifuging at 300 x g for 4 min). After centrifuging, remove the supernatant medium to condense the cells, and inject highly concentrated cells (3.0 × 104 cells/µL for NHBE cells) into the pocket in the ECM (Figure 3D). Incubate the HGC with cells in a CO2 incubator for 20 min at 37 °C so that the cells fall into the ECM pocket to fill the space created by the micromolds. If excessive medium or cells are present on the top surface, carefully remove using a pipette. Place the HGC on a 24-well-plate and add 100 µL of appropriate medium (Figure 3E). For NHBE cells, use a 1:1 mixture of commercially available specialized medium for NHBE and endothelial cells (see Table of Materials). Inject additional ECM to close the pocket in the ECM, and then incubate at 37 °C for 25 min. Cool down preheated 1.5% agarose to room temperature (approximately 20 °C). Drop approximately 10 µL of the agarose onto the top surface of the HGC to close the surface and prevent the ECM from falling out of the HGC during culturing and imaging (Figure 3F). Then, incubate the HGC for another 20 min at 37 °C to cure the agarose. Add medium to cover the entire HGC so that the osmotic pressure can help in providing nutrition to the cells inside the HGC. Place the culture dish or well plate containing the HGC on a microscope and orient the HGC to the camera frame. Then, obtain a sample image by bright field or phase contrast. Pick up and rotate the HGC to place a different surface down. Repeat steps 4.1.1 and 4.1.2 until images from all six sides are obtained. For fixation, apply 4% paraformaldehyde to the sample over the HGC at room temperature (approximately 20 °C) for 20 min, followed by two rinses of PBS for 10 min each. Permeabilize the HGC with PBS containing 0.5% Triton X-100 for 10 min at 4 °C, then wash 3x for 10 min with PBS. Incubate the HGC with 10% goat serum in IF-buffer (0.2% Triton X-100, 0.1% bovine serum albumin, and 0.05% Tween-20 in PBS) for 60 min at room temperature for a primary blocking step. For staining of a specific molecule, use the appropriate antibody. To observe the collective cell geometry, Alexa Fluor 488 Phalloidin can be used to stain actin. Place the HGC on a glass bottom dish under a laser or fluorescent microscope and perform scanning from six sides to obtain the entire sample image. Normal human bronchial epithelial (NHBE) cells were used to demonstrate the illustrated methodology and control the initial collective cell geometry to achieve a cylinder shape and a prism shape, respectively in an ECM environment. The multi-directional imaging results obtained by phase contrast as well as phalloidin staining of a cylinder shape (Figure 4A,B) and the prism shape (Figure 4C,D) are presented. The cells are suitably aligned to yield the desired 3D shape in the ECM environment. Subsequently, the cells were cultured for four days to form a specific shape and then were analyzed by multi-directional imaging. The large sample size makes it quite difficult to capture the entire tissue image from one direction; however, the HGC allowed imaging from up to six sides, revealing the whole tissue shape. Figure 5 shows the immunostaining results of the bronchial tree developed from the NHBE cells. The NHBE cells were initially controlled to a cylindrical shape in the HGC. Then, most of the branches were directed perpendicular to the cylindrical axis. 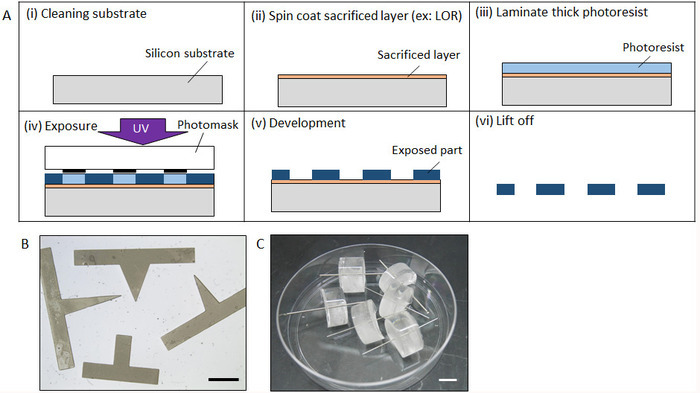 Figure 1: Fabrication process of hybrid gel cube device. (A) The polycarbonate cubic frame is set on a precooled ice box. (B) Agarose (1.5%) is injected to cover the bottom surface. (C) The cube is slid to be collected. (D) The cube is rotated to make another surface down. (E) Agarose (1.5%) is injected to form another agarose wall. (F) After an agarose wall is produced for three faces, agarose is injected through an open face. Scale bar: 5 mm. Please click here to view a larger version of this figure. Figure 2: Fabrication process of micromolds. (A) Fabrication process of a micromold by photolithography. (B) Complete form of a fabricated prism shape micromold by photolithography. (C) Fabricated micromold with cylinder steel. Scale bar: (B) 2 mm, (C) 10 mm. Please click here to view a larger version of this figure. Figure 3: Fabrication process of initial cell cluster control. (A) ECM (e.g., collagen and Matrigel) is injected into the HGC. (B) The micromold is set on the cubic frame with or without a holder. (C) After the ECM is cured, the micromold is removed. (D) After centrifuging, highly dense cells are injected and incubated. (E) Medium is applied. (F) Additional ECM followed by agarose are injected to cover the top surface of the HGC. Scale bar: 5 mm. Please click here to view a larger version of this figure. Figure 4: Results of initial cell control with NHBE cells. (A) Phase-contrast images of the cylindrically controlled NHBE cells taken for the bottom and lateral surface. The entire shape could be recognized by multi-directional observation without requiring fluorescent imaging. (B) Fluorescence images of the cylindrically controlled NHBE cells staining F-actin. (C) Phase-contrast images of the NHBE cells controlled in a triangular prism shape captured from the bottom and lateral surfaces. (D) Fluorescence images of the NHBE cells controlled in a triangular prism shape. Scale bar: 100 µm. 10x magnification lens (0.3 numerical aperture) was used. Please click here to view a larger version of this figure. Figure 5: Projected fluorescent images captured by multi-directional scanning. The NHBE cells were initially controlled to produce a cylindrical shape and cultured in the HGC for 4 days. Subsequently, actin was stained by phalloidin. The branches were elongated from the initial cylinder along the x axis, and the length, size, and angle from the axis were equally developed. Lower right image shows the schematic of the x-y-z axis and the sample shape. Scale bar: 100 µm. A 10x magnification lens (0.3 numerical aperture) was used. Please click here to view a larger version of this figure. The method presented in this paper is simple and can be performed without high-technology equipment. Concurrently, a precise cell cluster shape control result in the 3D space of hydrogel can be obtained. After the initial control, the cells can grow in the HGC as much as they are cultured on a dish. The multi-directional imaging is performed by rotating the sample with the HGC using any microscopy system, and it significantly enhances the imaging quality. The choice of the materials for the HGC frame and micromold is flexible as long as they are biocompatible. A 3D printer may be used to produce the HGC frame or micromold if the accuracy of the 3D printer is sufficient for their applications. The proposed method is compatible with many image enhancing technologies such as transparency reagents20,21 and light-sheet microscopy systems. By employing these technologies, the image quality can be improved. The volume of the agarose, ECM, and highly dense cells to be injected depends on the HGC and mold size. A careful manual operation that does not inject air bubbles is required, otherwise the bubbles formed will deteriorate the accuracy of the control, cell growth, and imaging quality. The fabrication process of the micromolds will be determined by the desired shape to control. Photolithography enables fabrication of precise 2D shapes with a certain depth, such as a prism shape on the order of micrometers; however, it is not effective with 3D shapes, such as a cylinder. The machining process allows us to fabricate the 3D shape, but in general, the dimensional accuracy is lower than photolithography. After the fabrication of the micromolds, coating of the 2-methacryloyloxyethyl phosphorylcholine (MPC) polymer on the molds is required to prevent adhesion on the ECM. By taking advantage of an HGC, microscopic imaging with or without laser exposure can be performed in multiple directions. 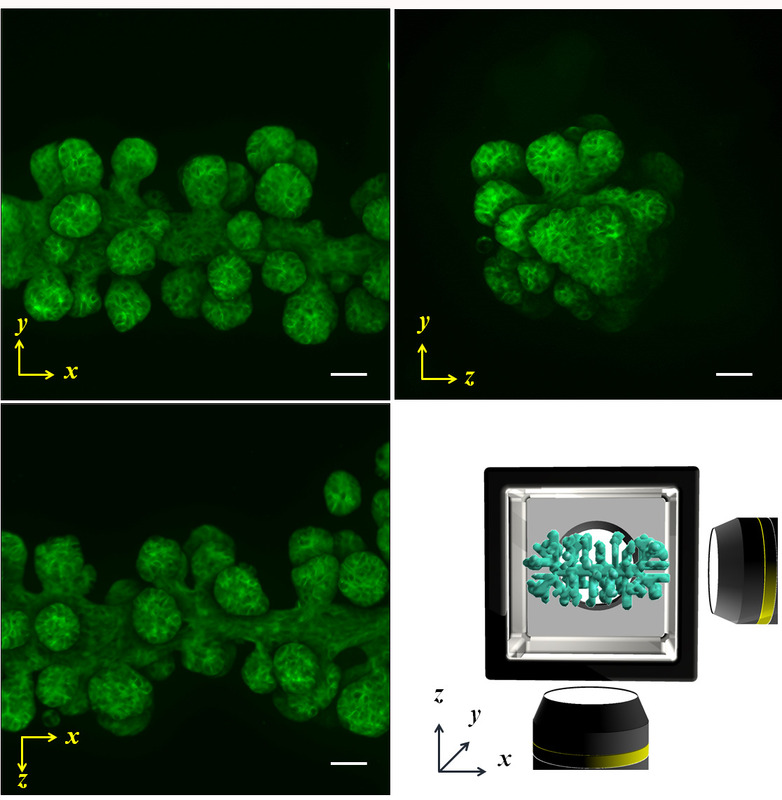 A 3D sample shape can be approximately recognized by multi-directional observation without fluorescent labeling; this method does not cause any cell invasiveness during observation. In contrast, fluorescent imaging is required for obtaining a more accurate 3D sample shape and molecular expression. The constraint of the presented method for initial cell control is that it cannot be applied to a mold with a complex 3D shape. The mold has to be removed by picking up without deteriorating the ECM. Thus, the mold is limited to a simple straight or tapered shape. To obtain more complex shape control, further development of the protocol is needed. The proposed methodology has broad utility and can be easily conducted in most of the laboratory environments. This simple procedure can overcome the limitations of 3D culture, imaging, and repeatability, and contribute to the further development required for 3D culture. The authors and the Osaka Prefecture University and Kyushu Institute of Technology have filed a patent application for a hybrid gel cube device, and Nippon Medical and Chemical Instruments Co. Ltd, Japan has recently commercialized the cube. The company did not affect any of the design, process, and methods described. This work was financially supported by JSPS KAKENHI (18H04765) and the Program to Disseminate Tenure Track System, MEXT, Japan. Baker, B. M., Chen, C. S. Deconstructing the third dimension - how 3D culture microenvironments alter cellular cues. Journal of Cell Science. 125, (13), 3015-3024 (2012). Sasai, Y. Cytosystems dynamics in self-organization of tissue architecture. Nature. 493, (7432), 318-326 (2013). Shamir, E. R., Ewald, A. J. Three-dimensional organotypic culture: Experimental models of mammalian biology and disease. Nature Reviews Molecular Cell Biology. 15, (10), 647-664 (2014). Choquet, D., Felsenfeld, D. P., Sheetz, M. P. Extracellular matrix rigidity causes strengthening of integrin- cytoskeleton linkages. Cell. 88, (1), 39-48 (1997). Hannezo, E., Prost, J., Joanny, J. -F. Theory of epithelial sheet morphology in three dimensions. Proceedings of the National Academy of Sciences of the United States of America. 111, (1), 27-32 (2014). Tawk, M., et al. A mirror-symmetric cell division that orchestrates neuroepithelial morphogenesis. Nature. 446, (7137), 797-800 (2007). Eiraku, M., et al. Self-organizing optic-cup morphogenesis in three-dimensional culture. Nature. 472, (7341), 51-58 (2011). Zegers, M. M. P., O’Brien, L. E., Yu, W., Datta, A., Mostov, K. E. Epithelial polarity and tubulogenesis in vitro. Trends in Cell Biology. 13, (4), 169-176 (2003). Affolter, M., Bellusci, S., Itoh, N., Shilo, B., Thiery, J. P., Werb, Z. Tube or not tube: Remodeling epithelial tissues by branching morphogenesis. Developmental Cell. 4, (1), 11-18 (2003). Denk, W., Strickler, J., Webb, W. Two-photon laser scanning fluorescence microscopy. Science. 248, (4951), 73-76 (1990). Huisken, J., et al. Optical Sectioning Deep Inside Live Embryos by Selective Plane Illumination Microscopy. Science. 1007-1009 (2004). Hagiwara, M., Kawahara, T., Nobata, R. Tissue in Cube: In Vitro 3D Culturing Platform with Hybrid Gel Cubes for Multidirectional Observations. Advanced Healthcare Materials. 5, (13), 1566-1571 (2016). Hagiwara, M., Nobata, R., Kawahara, T. Large Scale Imaging by Fine Spatial Alignment of Multi-Scanning Data with Gel Cube Device. Applied Sciences. 8, (235), (2018). Kolesky, D. B., Homan, K. A., Skylar-Scott, M. A., Lewis, J. A. Three-dimensional bioprinting of thick vascularized tissues. Proceedings of the National Academy of Sciences of the United States of America. 113, (12), 3179-3184 (2016). Mironov, V., Visconti, R. P., Kasyanov, V., Forgacs, G., Drake, C. J., Markwald, R. R. Organ printing: Tissue spheroids as building blocks. Biomaterials. 30, (12), 2164-2174 (2009). Onoe, H., et al. Metre-long cell-laden microfibres exhibit tissue morphologies and functions. Nature Materials. 12, (6), 584-590 (2013). Miller, J. S., et al. Rapid casting of patterned vascular networks for perfusable engineered three-dimensional tissues. Nature Materials. 11, (9), 768-774 (2012). Hagiwara, M., Nobata, R., Kawahara, T. High repeatability from 3D experimental platform for quantitative analysis of cellular branch pattern formations. Integrative Biology. 10, 306-312 (2018). Tainaka, K., et al. Whole-body imaging with single-cell resolution by tissue decolorization. Cell. 159, (4), 911-924 (2014). Murray, E., et al. Scalable Proteomic Imaging for High-Dimensional Profiling of Intact Systems. Cell. 163, (6), 1500-1514 (2015).